As the No. 1 ranked ITF junior boy, Taylor Fritz was a popular interview subject at Wimbledon this year, and I spoke with him several times during the junior tournament. Although many of his peers have turned pro this spring and summer, Fritz has not yet made that decision officially. But from this article I put together for The Tennis Recruiting Network based on those interviews, it appears unlikely that he will attend college. All the major sports management agencies are interested in Fritz, so his choice will be a story this summer (he says by the end of the US Open). But it's not as if it is a lifetime commitment. Jack Sock, who signed with CAA initially, has moved to IMG, it was announced today. 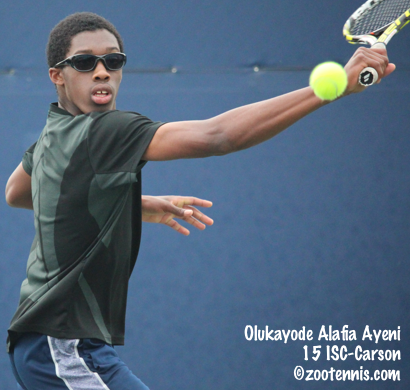 Olukayode Alafia Ayeni, who turns 16 next month, won his first two ITF titles last week at the Grade 4 Copa Merengue in the Dominican Republic. Ayeni, seeded No. 11, beat the No. 7, No. 4 and No. 1 seeds to reach the final, where he defeated No. 2 seed Salvador Mijares of Venezuela 6-2, 6-1. Ayeni and Robert Loeb won the doubles title, with the No. 3 seeds taking a 7-6(8), 7-5 decision from No. 4 seeds Valentino Caratini and Camilo Ugo Carabelli of Argentina. At the $50,000 Sacramento women's Pro Circuit tournament, which finished late last night, 2014 US Open girls finalist Anhelina Kalinina of Ukraine, the No. 8 seed, beat top seed An-Sophie Mestach of Belgium 4-6, 6-4, 6-3. It's the third Pro Circuit title for the 18-year-old, but the first at the $50,000 level. Ashley Weinhold and Caitlin Whoriskey(Tennessee) won the doubles title, beating another unseeded pair, Nao Hibino of Japan and Rosie Johanson of Canada, 6-4, 3-6, 14-12 in the final. It's Whoriskey's ninth pro doubles title, but her first at a $50,000 tournament and her first with Weinhold as a partner. 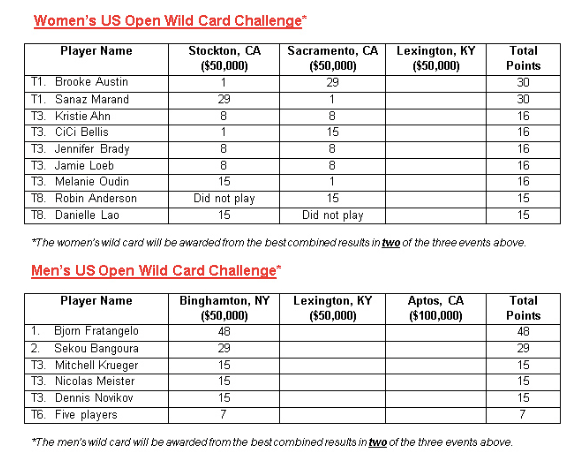 The third and final tournament in the USTA's Women's US Open Wild Card Challenge is this week in Lexington. As you can see from the standings chart, it's still anyone's wild card, although Brooke Austin lost in the first round of Lexington qualifying to Jamie Loeb, so she can't accumulate any more points. Loeb is one of five Americans in Tuesday's final round of qualifying. The men's Lexington Challenger is just the second of their three tournaments, and next week at Aptos is a $100,000 event, so there is a very long way to go in that race. Noah Rubin qualified for Lexington with three wins, including a win over No. 2 seed Frederik Nielsen of Denmark and today's victory over Dimitar Kutrovsky(7) of Bulgaria. Alex Kuznetsov also qualified, putting a total of eight Americans in the main draw. Rain has stopped play at the BB&T Atlanta Open today, but Jared Donaldson, Austin Krajicek and Denis Kudla won their final qualifying matches to join nine Americans already in the main draw. Donaldson, who was unseeded in the qualifying, beat Gastao Elias of Portugal in the first round, No. 5 seed JP Smith of Australia in the second round and No. 2 seed Guido Pella of Argentina in today's final round of qualifying. Kudla, the No. 1 seed, won both his qualifying matches in straight sets, as did No. 3 seed Krajicek. The lower level Pro Circuit events this week are a $15,000 Futures for the men in Edwardsville, Illinois, and a $10,000 tournament for women in Austin, Texas.